You don’t need to look far to find hilarious coincidence and irony. It can be found in our own backyard if you look hard enough. The world is full of humor. There are the signs in awkward places. There are the events that make you wonder, “How in the world did that happen?” There are the people who do well-meaning things but then mess it up in the funniest ways. Here are 20 examples of it to brighten your day. Maybe these examples will help you find the irony in your own world so you can take life a little less seriously. 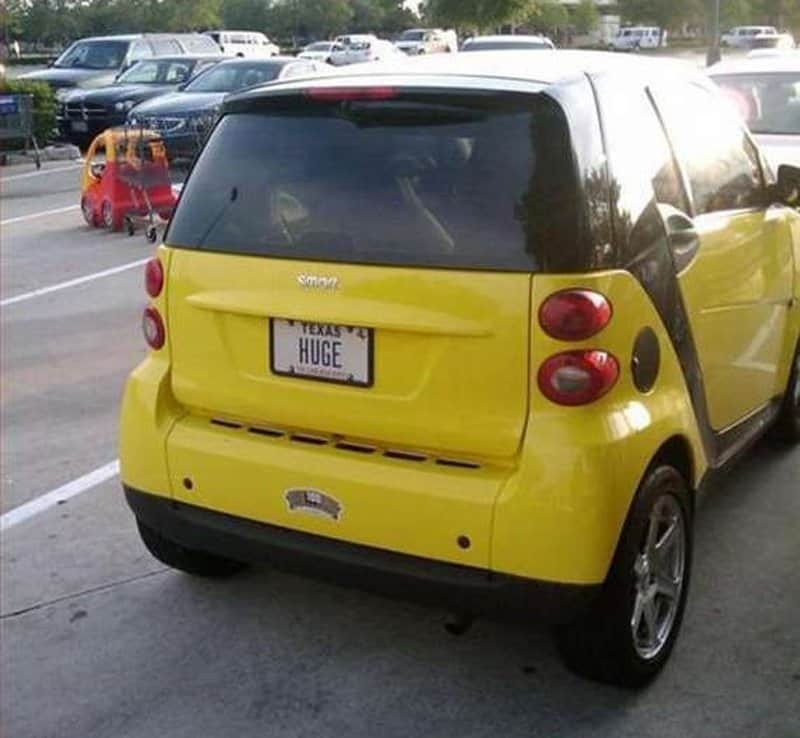 Yes, the license plate on this small car says, “Huge.” Maybe the owner thought if she voiced her wish, it would come. To dive or not to dive, that is apparently the question. These people could at least stop teasing us about it. We can only hope that the pilot of that plane is okay and that he was flying to the school to improve his skill. If this is what a graduate of the school can do, we’re not going there. There is one of these in almost every town. 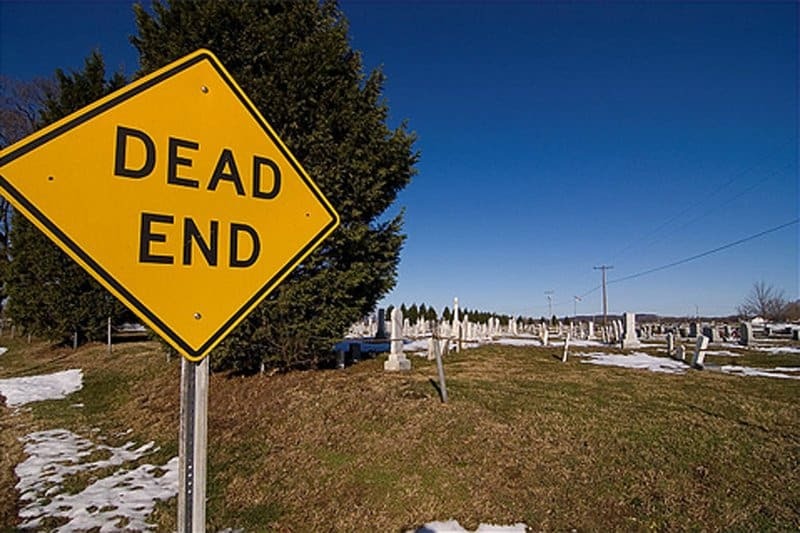 The dead end road right by the cemetery makes us chuckle every time. 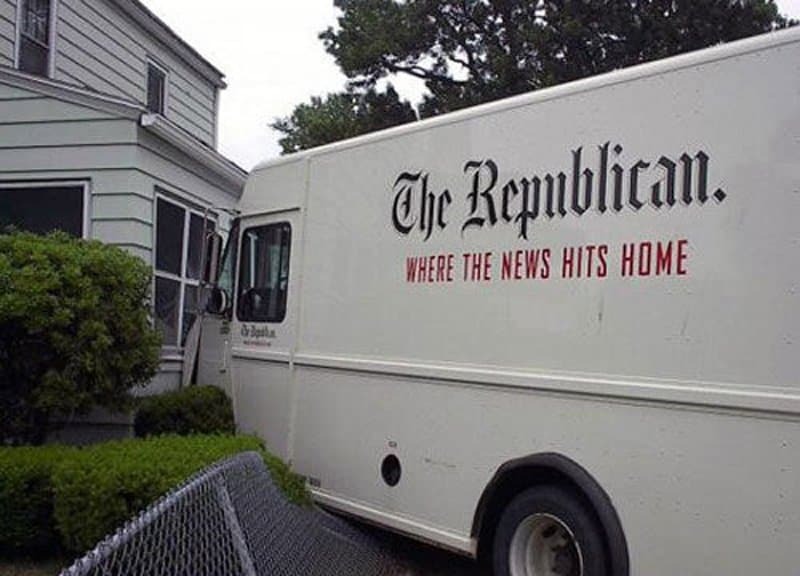 This driver took his job literal by driving his news van into a home. Hopefully this was some employee’s idea of a joke. If not, they need to stop the false advertising. 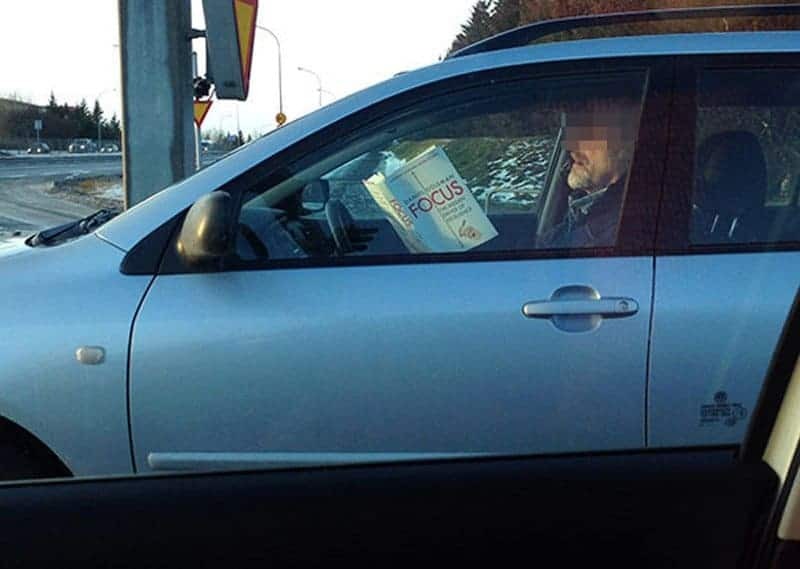 A driver reading a book titled “Focus” when he really should be paying attention to the road. This puts all other distracted drivers to shame. Ice Cream To Celebrate Lost Weight? 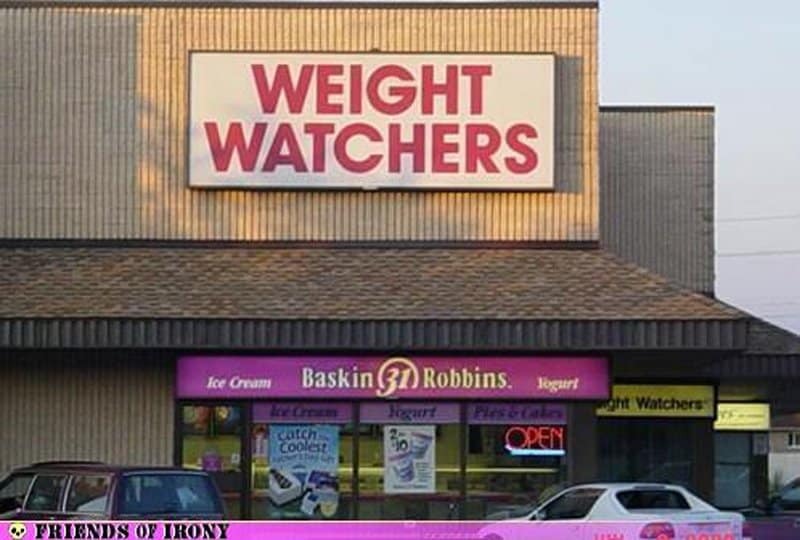 It’s too cruel to have a Weight Watchers right by that delicious, delicious ice cream parlor. It’s like having an AA meeting in a bar. 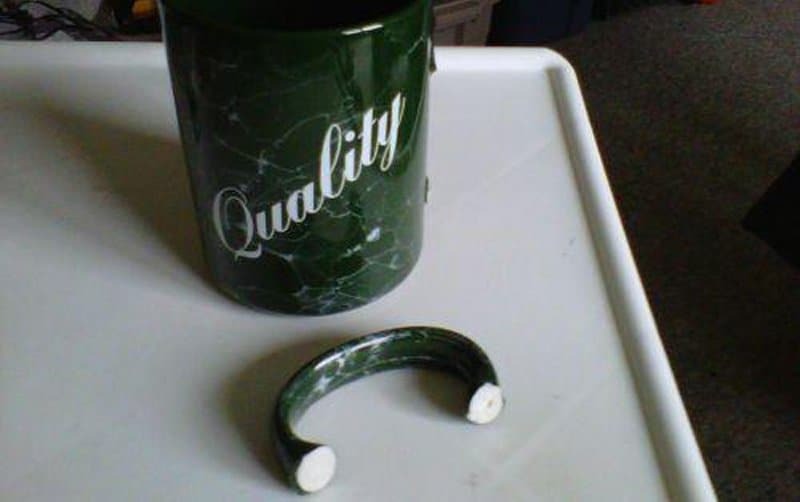 “Quality” coffee cups don’t fall apart after one use. These manufacturers need to read a dictionary. 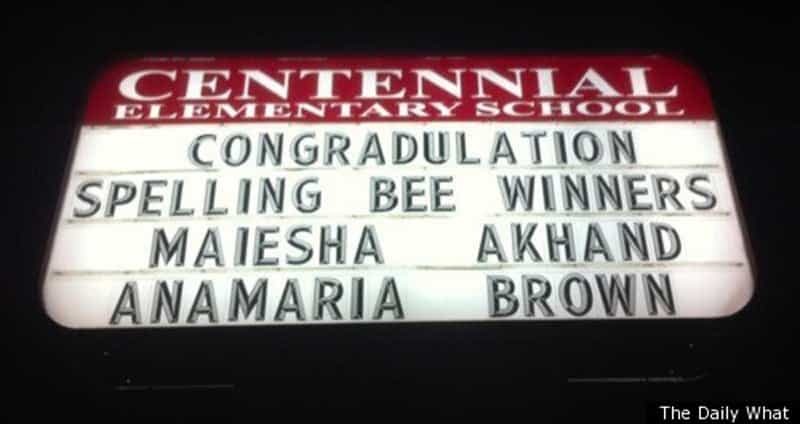 We assume it wasn’t a graduate of this school who couldn’t design the building or the letters to have enough room for the name. Get Flames, They Said. It’ll Be Cool, They Said. 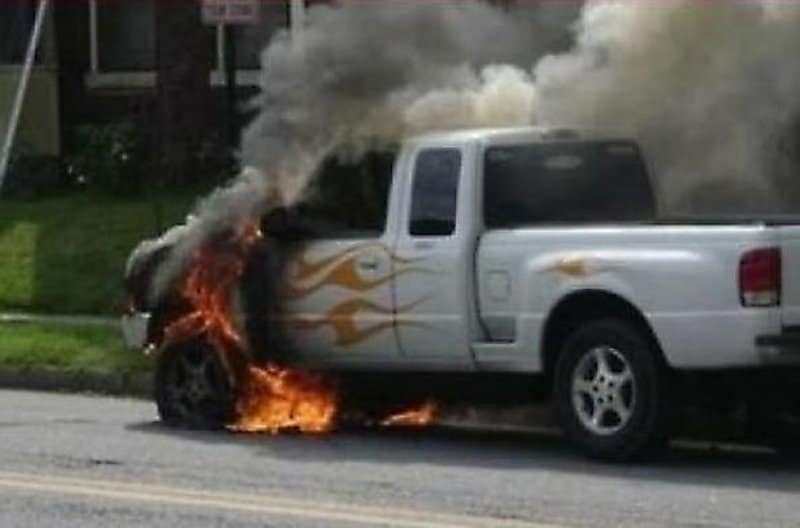 This person is really wishing he hadn’t decorated his truck with flames. He surely won’t decorate his car with flames ever again. Don’t tempt fate! 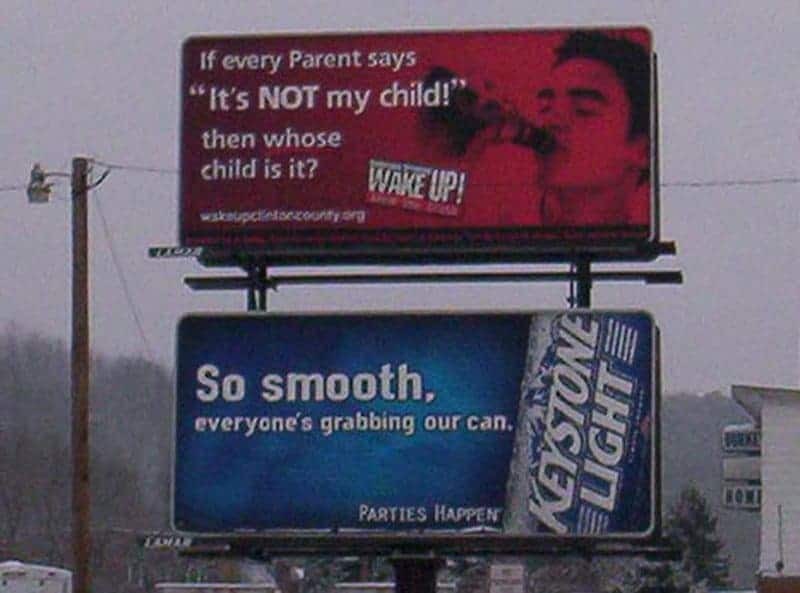 A PSA about teen drinking right by a beer advertisement. You’d think someone in the office would’ve caught that one before the boards went up. 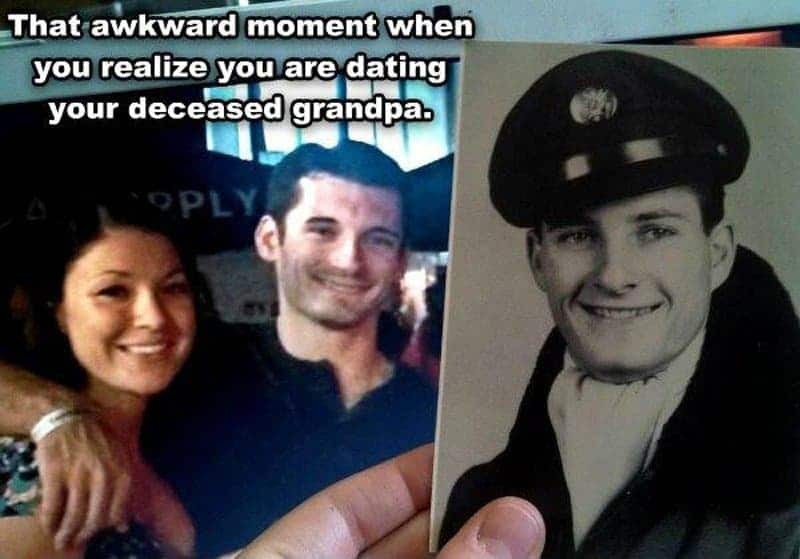 So, this girl realized one day that her boyfriend looks exactly like her grandpa did at his age. They are good-looking guys. Her and her grandma had good taste. Nothing wrong with that. Let’s hope the driver of this van had never stepped foot into this driving school before. We can be assured that this driver will be going to a driving school soon. 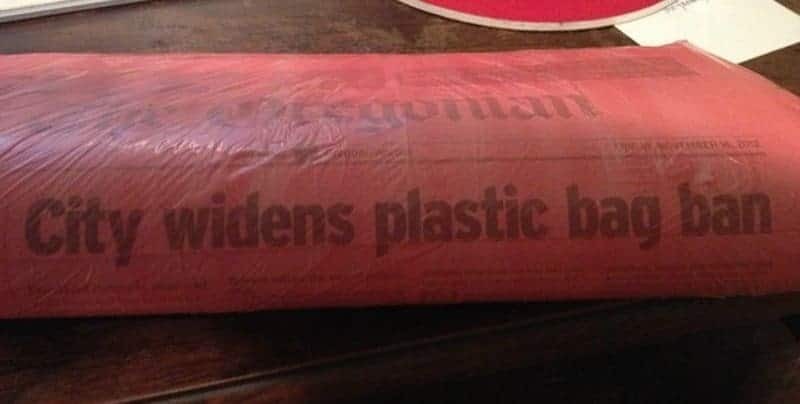 This city in Oregon is banning plastic bags, except for the bags that the newspaper comes in. Have you ever tried to reuse a newspaper bag? 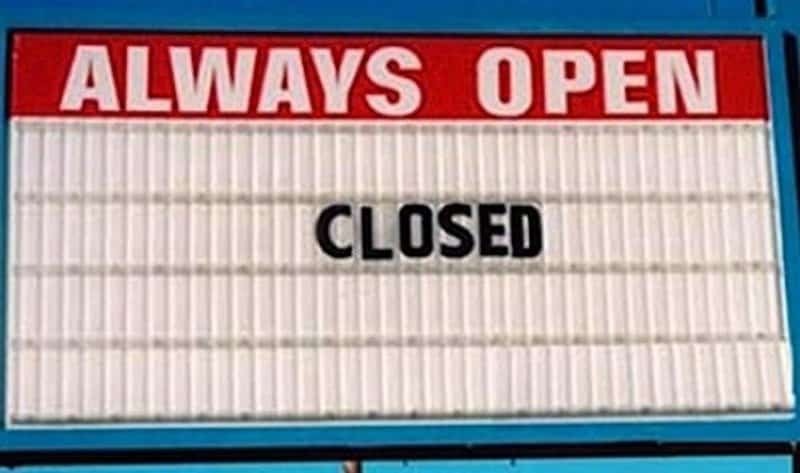 What a yummy bit of irony? 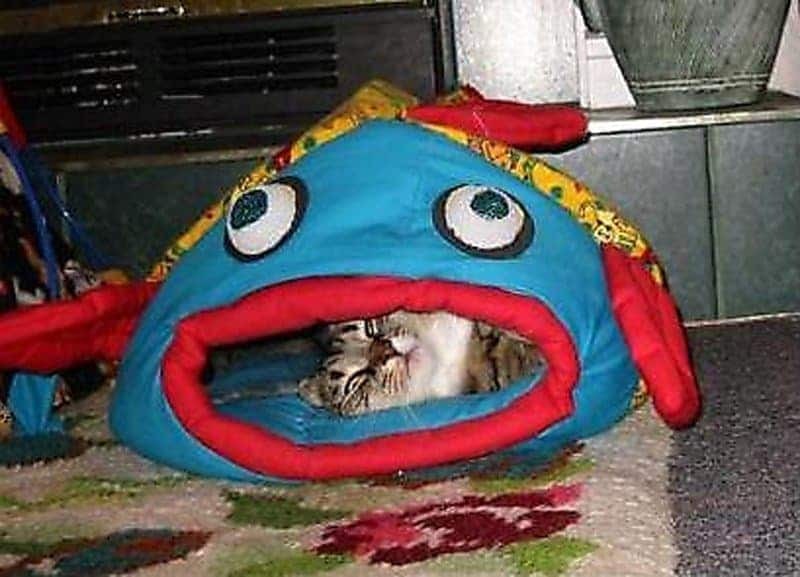 Here is a cat peacefully sleeping inside a fish. 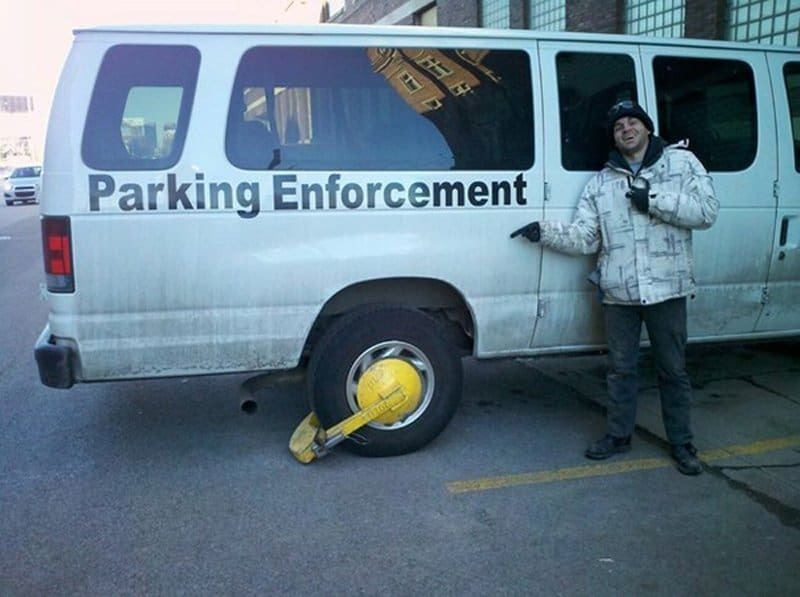 While we can be happy that even parking enforcers get their cars clamped, how do they expect us to park properly when they can’t even set a good example? Where do we even begin to describe this? 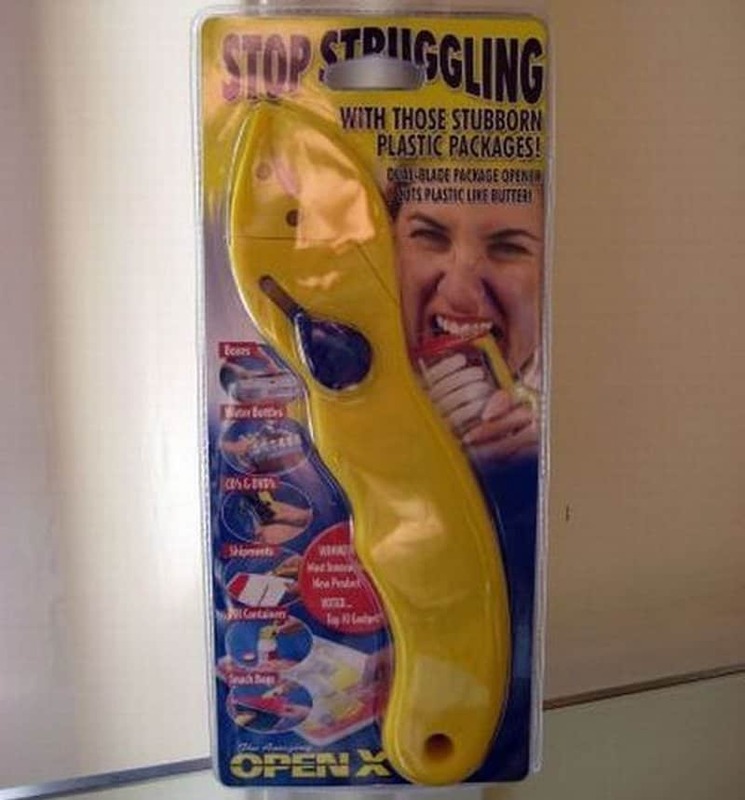 A device to help you to open those difficult plastic packages comes in one of those same kind of packages.